June 6, 2016 – NASA has awarded Aerospace a $100,000 grant to investigate the possibility of developing an extremely thin spacecraft that would wrap around debris and remove it from Earth’s orbit. The concept, called Brane Craft, is a 1-meter square spacecraft that is less than half the thickness of a human hair, and therefore exceptionally light, maneuverable, and fuel efficient. “The Brane Craft concept is based on the one-dimensional compression of a complete spacecraft and upper stage into an essentially two-dimensional object in order to maximize power-to-weight and aperture-to-weight ratios,” said Dr. Siegfried Janson, the lead investigator on this project. If you have trouble wrapping your brane, er brain, around the concept, think of the spacecraft as a large piece of high-tech plastic wrap zipping through space and enveloping flying garbage. NIAC provides $100,000 for nine months of research, with the possibility of another $500,000 for two more years if the results are promising. Janson’s idea for the Brane Craft is definitely cutting-edge, and it could provide a solution to a difficult problem—how to get rid of all the orbital debris that could harm active spacecraft. Janson had previously considered a concept called the Distributed Orbital Garbage Sweeper (DOGS). DOGS would consist of many small satellites sent to “fetch” individual pieces of orbiting debris and bring them down to burn up in the atmosphere. The problem was the cost. “Sending conventional spacecraft, even CubeSats, to each of the thousands of 10-cm or larger debris objects for active deorbiting is prohibitively expensive,” Janson said. Undaunted, Janson, who has worked in the field of small satellites for about 20 years, decided to go even smaller, at least in mass, with the Brane Craft. To put the mass in perspective, a GPS IIF satellite weighs about 1500 kg, and a standard CubeSat is about 1 kg. The Brane Craft would only weigh about 50 grams. The 30-micron-thick spacecraft would have a very high thrust-to-weight ratio, and would be capable of traveling long distances, which opens up other possibilities beyond just the removal of space debris. It sounds great in theory, but obviously there are a number of engineering challenges associated with actually creating a flat spacecraft. Janson has identified a number of current technologies that he believes could be adapted for the Brane Craft, such as thin film solar cells and electrospray thrusters to propel the craft through space. To allow the Brane Craft to change shape, he is considering electrostatic polymers that will contract like muscles when a voltage is applied. He’ll also be investigating thin film transistors, super flat cameras, and more. “This whole exercise is to see: can I get everything that I need for this spacecraft to fit on a thin sheet?” Janson said. That’s what he will spend the next nine months researching. 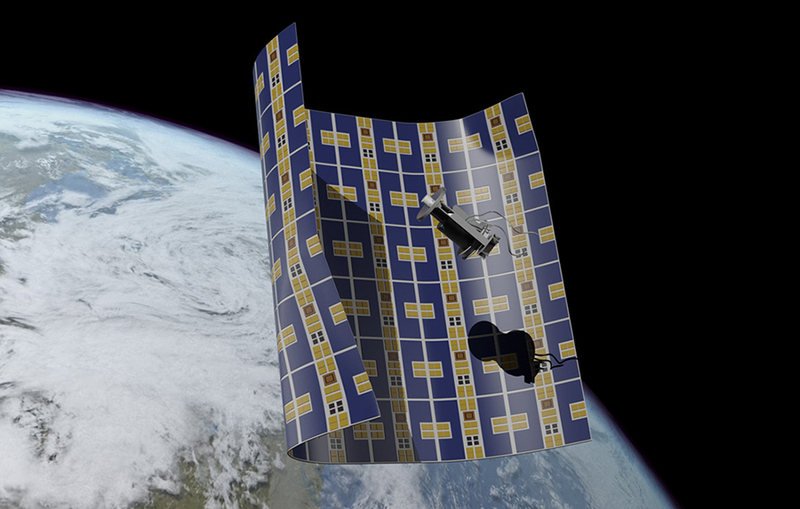 If successful, the Brane Craft project could provide a method of cleaning up the plethora of junk around the Earth, not to mention a really cool spacecraft with other potential uses.